We have one more early preview from Archie’s Sonic series that slipped through the cracks. It’s for another compilation of recent fare, neatly packaged into what Archie calls Sonic Saga Series 6. The compilation covers the Mammoth Mogul trials and tribulations as chronicled in Sonic #185 through 189. A new cover, as always, is included. You can look at that preview after Archie’s formal synopsis. It’s SONIC VERSUS EVERYBODY! Blast into the action at Sonic speed with the continuation of the all-new Sonic Saga graphic novel series! In this volume, Sonic battles the ancient, evil Mammoth Mogul—who has lost his Chaos Emerald and been imprisoned, but backing him into such a corner only made him more dangerous! 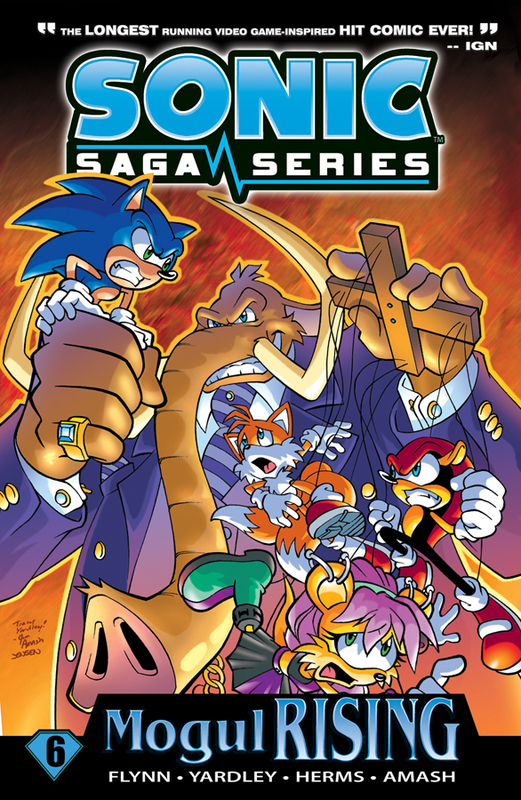 Mogul uses his remaining powers to summon a new Fearsome Foursome—and Sonic is forced to be one of them! Every mercenary and cut-throat is hired to take Sonic’s shoes—feet being optional! It’s Sonic versus everyone else while the malicious mammoth laughs from the shadows! How can Sonic overcome all the odds? Find out inside! SONIC SAGA VOL. 6 collects selected stories from Sonic the Hedgehog#185-189.